Knowledge Hunter: Global knowledge used locally, with a mobile app. Global knowledge used locally, with a mobile app. Today Maarten Lens-FitzGerald (whom I follow on Twitter) shared images of a mobile application ING Bank is launching built by his company (SPRXMobile) in collaboration with Wikitude. The application is called Wegwijzer ("signpost"). It helps you find ATMs where ever you are, with your Googlephone (G1). By turning the G1 to camera-mode and pointing the camera to the environment around you, an overlay on the screen will show you where the nearest ATMs are. A so-called location aware augmented reality mobile application, i.e. it augments the reality you see through the camera with an overlay projecting information on the image. This information can be virtually anything geo-tagged. 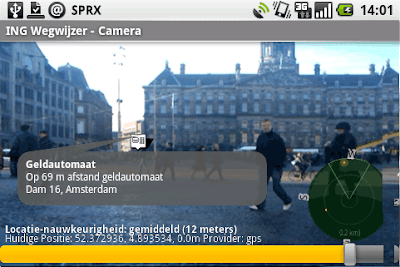 The picture below demonstrates the augmented reality camera view of Wikitude Augmented Reality on a G1 phone from the Dam square in Amsterdam, The Netherlands. The device displayed is a G1 Google phone, running Android. Wikitude is a mobile travel guide based on Wikipedia and Panoramio. Search landmarks in your surroundings and view them on a map, list, and on an Augmented Reality (AR) camera view: What you see is an annotated landscape, mountain names, landmark descriptions, and interesting stories. Bear this in mind and read my previous post on the role of location based services in the enterprise. Or even better, contextual services. Contextual Services are more then just Location Based Services. Your context can also be a virtual presence like a chat room where you are talking. You share the context with the people you chat with, but have a different physical location. Zcapes is the first service that is contextual. Wait and see what Zcapes will bring.